Everyone is aware that many religions practice some form of fasting as a religious observance. The practice has been occurring within various cultures for millennia with no known negative consequences. So long-term fasting as a way to control body weight would appear to be nothing more than a logical extension of this well-known and accepted human activity. Since weight gain is caused by storage of fat produced by overconsuming calories in excess of one’s immediate need, one would expect that reducing your intake of energy might be an effective long-term strategy of weight management. Thus it is not surprising that in a country such as the USA where the incidence of obesity is reaching epidemic proportions, intentional fasting has become a fashionable fad. Proponents of fasting claim that it is easier to stick with than other weight control methods they have tried. 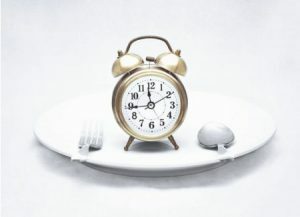 In one form of the method, you fast 16 hours and eat only within an eight-hour window each day. In other methods, eating is allowed only within a four-hour window or even during only one hour a day. Another variation is fasting 2 full days each week. Although fasting should mean consuming only water, in reality, most practitioners eat a small amount of food — up to 25% of normal — on fasting days. Researchers claim that in addition of losing weight, fasting may increase your lifespan, delay the onset of cancer and type 2 diabetes and enhance memory. However, it is also known that some practitioners of fasting experience binge eating, very low blood pressure, headaches, and even fainting. The question is, does the method really work to lose weight and reverse obesity? Fasting came into being as an offshoot of research on the health benefits of calorie reduction. Studies over the last 100 years showed that daily energy (food intake) restriction to the tune of 20-40% prolonged the life of animals while reducing illnesses. However, when researchers noted weakened immune system in very young and very old animals on severe calorie restriction, they started to experiment with an alternate method of energy restriction – fasting. In 1946, The Journal of Nutrition published a study showing that rats made to fast every third day lived longer than control animals. In 2003 Mark Mattson at Johns Hopkins University found that mice fed on alternate days were healthier than mice that were calorie restricted by 40%. In 2008 Eric Ravussin and others at the Pennington Biomedical Research Center in Baton Rouge, Louisiana investigated the benefits of calorie reduction on human health. The original goal of the experiment was to reduce calorie intake by 25%. Although the study participants achieved a reduction of only half of that, about 12% less food than ordinary daily intake, they experienced lowered blood pressure, cholesterol, glucose, and insulin levels. This indicated a possible reduced risk for heart disease, diabetes, and cancer. 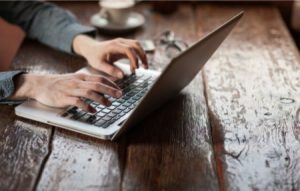 In addition, age-estimation algorithms revealed slower aging process in the bodies of the study group compared to that of the control group. But does it work in the long-term? Although those studies seem positive, other studies show that maintaining fasting regimen is simply not sustainable over the long-term. Like every new diet regimen, one’s initial enthusiasm for fasting as a way to control your weight is often strong. Many people feel empowered because they are in charge of deciding what, when, and how much to eat. However, as with any dietary regimen that fails to consider the body’s natural needs for food intake, fasting fails as a sustainable endeavor to control body weight. I suggest that the failure of any weight control diet based primarily on restricting your food intake is not surprising for at least two reasons. First, if energy intake is the basis for how our body tries to control its weight, one might expect some type of “calorie counter” in the mouth, the point of entry of nutrients. But this is not the case. Nature designed our mouth with taste and smell receptors to enjoy food, not to count the energy calories in what we eat. Secondly, the body needs over 100 types of nutrients, many of which do not contain energy calories, such as vitamins and minerals. When you deprive the body of these nutrients, many of which need to be replenished daily or almost daily, the body will suffer some consequences, such as what the experiments cited above discovered. Let me give you a shocking piece of news. What you may not realize is that fasting is already a daily occurrence in every person’s life. Although your body is spending energy and utilizing nutrients on a continuous basis, most people do not eat continuously. In effect, the natural act of eating—when you actually sense hunger—occurs at unpredictable intervals. In between each episode of eating, you are fasting. In addition, no one can deny that you are fasting when you are sleeping, as noted by the very compound word “breakfast” for the first meal after fasting during sleep. If hunger denotes not only the need for energy-containing nutrients but also other nutrients needed for maintaining a healthy body and weight, what is the reason for the unpredictable nature of the hunger sensation? My view is that the nerve centers in the brain in charge of generating your sensation of hunger operate based on detecting a cumulative deficiency threshold level of many nutrients, not just a single one. The only exceptions to this might be when the brain detects a severe deficiency of an important nutrient such as glucose, which the brain needs to function. But in general, hunger signals that the body is looking for a variety of nutrients different in type and quantity. We have proof that the brain literally suggests to us what to choose to eat based on what the body needs. To confirm this, all you have to do is observe the food consumption practices of human babies and toddlers. When they have access to a variety of foods, they not only consume what they need for optimal growth and development, but they also stop eating when enough needed nutrients are consumed in the required amounts at each meal. In other words, humans actually have a natural control mechanism that could prevent us from overeating even when there is an abundance of food available. As we become adults, we succumb to “bad eating habits” for a variety of reasons, meaning that we stop paying attention to eating only when we are truly hungry. We may be driven to eat (and overeat) by stress, by peer pressure, by bad timing, or by lack of attention to what we are eating such as having a meal while watching TV or talking. So rather than following a fad fasting diet, I suggest that you can control your weight by beginning to pay close attention to your body’s natural hunger and satiation signals. Before eating, be mindful and ask yourself if you are truly hungry. While eating, I suggest that you can regulate your calorie intake by paying attention to your taste and smell receptors. Eating only when you are hungry, deliberately chewing what you eat, and terminating the act of eating when the intensity of enjoyment subsides in your mouth is how you can eat for healthy, sustainable control of your body weight. In this way, you will naturally reduce your calorie intake without the pangs of hunger and struggle to convince yourself that fasting makes sense for anything but an occasional religious or spiritual purpose. 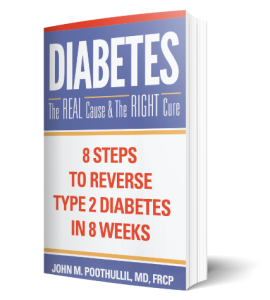 Has the information you have learned from my posts and books helped you overcome and control your Type 2 diabetes? I want to hear from you! Sharing your success with others will help them to decide to try something new!